Practicing for the benefit of others can take many forms. It can involve a dedication to mature further along the path of liberation so we become kinder, freer, wiser, and more generous people. It can also take the form of actively supporting others in their practice. When this support is offered through our time and personal labors, it is called “Dharma service”. 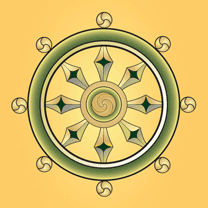 Dharma service is central to meditation retreats at the Insight Retreat Center. Every morning all retreatants participate in a 20-minute period of “Sangha Service” where much of the basic cleaning of the center occurs. As the name implies, this cleaning is service offered to the retreat community. Dharma service is also how the registration, cooking, managing, and the many other larger operations of retreats are accomplished. Those who do this work provide the opportunity for others to benefit from retreat practice. In addition, and perhaps more importantly, Dharma service infuses a retreat with goodness, generosity and compassion that greatly support the deep inner work of meditation. It shows what is possible when self-centeredness and fear no longer dominate one’s life. Dharma service is as much about serving one’s fellow retreatants as it is about getting the work done. It is work suffused with the good intentions of those doing the work. Retreatants can often feel this goodness and so be inspired in their retreat practice. For those offering service, the work brings joy both in providing an outlet for one’s goodwill and care, and in knowing one is benefiting others. Offering Dharma service so others may engage in Dharma practice is one of the most rewarding activities one can do. Sometimes Dharma service on retreats is inspired by the wish to offer something back for the benefits one has received. It is an expression of the saying, “gratitude begets generosity.” When expressed, gratitude has a chance to grow into its full potential as a nourishing and calming force. Sometimes Dharma service is an opportunity to bring one’s practice to activities that are as valuable for spiritual growth as meditation practice. Certainly, the service work one does and the interpersonal contacts it entails are a rich area for Dharma practice. While both the work done and the interactions we may have while doing it may be similar to what occurs in daily life, because they occur on retreat, there is a much greater ability to find the Dharma in the midst of Dharma service. This can bring great insights and doorways to inner freedom, including when our practice is applied to any personal and interpersonal challenges that may arise with the service work. In this way, Dharma service may allow us to grow in ways that do not normally happen in meditation. When we offer Dharma service on retreat, it expands the practice potential of the retreat. Dharma practice is enhanced through service. One benefit of engaging in some of the more responsible forms of Dharma service is having greater contact with the teachers of a retreat. Cooks, managers and teachers may have regular conversations and meetings about work and retreat issues. In this way these retreatants and the teachers get to know each other in wider ways than when one is an ordinary participant in a retreat. Teachers can be inspired by the example of generosity and mindfulness they see in the cooks and managers. Furthermore, in becoming better acquainted with those offering service, the teachers can offer more personalized Dharma support. With more teacher contact, cooks and managers sometimes have unique opportunities to witness the insights, wisdom and compassion of the teachers. Along the lines of the saying, “Teachers teach more by how they are, than by what they say,” those doing Dharma service often have frequent opportunities to witness how teachers conduct themselves, and so they can learn from witnessing the Dharma being enacted as much as from the Dharma being taught. Just as we can practice meditation for an entire lifetime, so also can we do the work of Dharma service, when we bring as much mindfulness, ease, and liberating insight to doing service as we do to meditation. And as meditation reveals greater and greater dimensions of selflessness, so Dharma service is also a wonderful arena in which to discover and express this dimension in the rest of our lives. Selfless Dharma service can expand far beyond retreats; it can become what we offer the world wherever we go and whatever we do. In its full maturation, Dharma service is just service, and service is just life interacting with the deepest and most beautiful aspects of self and others.